A fine evening last Friday evening at the Hope and Anchor, witnessing another great show by Straighten Out. As people have said above, go and see this band. They make a great effort to travel the country and their show is first class. A really enjoyable evening and very nice to see people from this Forum at the event. Some people had made a long journey to catch this gig and I take my hat off to them. Fine effort all round from the band and from their fans. The sound was superb. The show was superb. The meet up was superb. The Pinot Grigio was superb. My silly dancing was superb. Agree, a great night......I even danced!!! "A large glass of Pinot is £4.70. Can I suggest we move onto bottles at £7.90 each ?" I've got some chloroform and handcuffs, just for you. Wish I could have made this one. First SO H and A gig I've missed and they're always fantastic. And I missed PiL and Touchline's "dancing" - gutted. Sure you'll get over it Kaff. Not the end of the world now is it? ThruBeingCool wrote: Sure you'll get over it Kaff. Not the end of the world now is it? me too ! big time ! There was smoke comin outa my shoes by the time I left the place ! Yup you sure were giving it some, almost as much as Paul!! 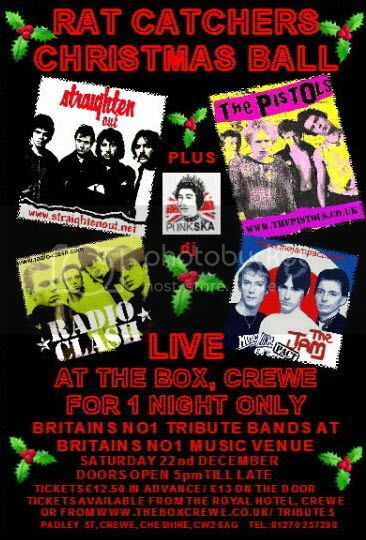 I've just noticed they're playing at The Box in Crewe on July 28th, might have to go and have a look at that. Pity it's a Saturday night though. Hope you can make it mate, I hope there is a decent turnout for this gig. Coming up this Saturday - Straighten Out return to The Railway in Bromley Cross, Bolton. Always a great night this one.